"Prospero will be avenged. Fenris WILL burn." The Command of Tzeentch has lead my inquiry to your Server. I must know the knowledge, the knowledge of your IP. This is Cauy of the Death Korps of Krieg, asking what the IP is, over. This is Lord Inquisitor Froggen, I have heard your desperate transmission and I have a squad of inquisitors ready. But I need the IP so my elite squadron can reach you. Transmission_Incoming: This the Daemon Prince of Khorne, we have recieved your vox transmission. We belive that the Chaos attacking in Quadrant 988 are Slaanesh. We need immediate IP Coordinates to dock. I repeat, immediate IP Coordiantes to dock. You know us Khornade hate the Slaanesh. Please, immediate IP Coordiantes. Vox-Transmission Incoming - This is Interrogator-Chaplain Torael of the Dark Angels chapter. Our sources report Fallen activity in your sector, I have been dispatched to investigate. I require ip coordinates to dock. I will aid you with the xeno threat while there, I believe the fallen have allied with the xenos - Vox-Transmission ending. Magos Tolvik reporting i will protect the anchint machine shirne within the training bay. no machines will be lost under my watch. glory to the OMNISSIAH! Salamanders are ready to "Charge into the battle unto the anvil of war!" The flamers and dreadnoughts await the time to stike we will be arpoching the west side. <Vox staic> Brother-Captain Tarris. This is Force Commander Ayaine. I have recieved your distress call and forces are ready to be deployed. We will be arriving in T-95 minutes. We are the tip of his spear, the mail on his hand. We are Space Marines and we shall cleanse the universe of taint! For the Emperor!! Da orks wil help ya gitz if ya let us get first crack at da shiny loot, send me da I.P fingy an me meks will get us der, Waaaaagh! Brother-Captain Tarris? This is Brother-Captain Dreugen of the Blood Ravens 3rd Company. Me and my brothers have received your distress call and are being deployed in T- 45 minutes. The Iron Hands, Clan Raukhan at your service, requesting IP. is this ever going up? The Ordo Xenos has acknowledged your distress call and is sending a Deathwatch marine to your position. requesting IP. This is Marnus Calagar Chapter Master of the ultramarines we have recived your distress beacon but can not locate the IP when we recive that we will send high suzarian Cato Sicarius to assest you with the second company in the EMPEROR'S name "WE MARCH FOR MAGGRAGE AND WE SHALL KNOW NO FEAR!" We need the ip to drop a force of death korps of kreigs. "We once owned the stars and you dare oppose us?" Noxus'Deim, Fallen Angels(TM) Nurgle chapter will come to help you and spread the Rot of grandfather Nurgle, Send the IP Coordinates to the Plauged Seraphim Battle Barge Immediateley! Fairly good with the lore, and a competent builder too. Dont be so sure about that Captain. so... is this actually going to happen? "There is no time for peace, There is no Respite, There is only WAR"
Come Brothers, Chaos Awaits it's destruction! I'm a boss Warhammer40k player, and You got a spaceMarine right here bro. AVE DOMINUS NOX I stand in midnight clad brother. What are the IP coordinates? I shall be there, bolter in hand, and death in my hands. Chaos Space Marine Faction right here. Night Lords. 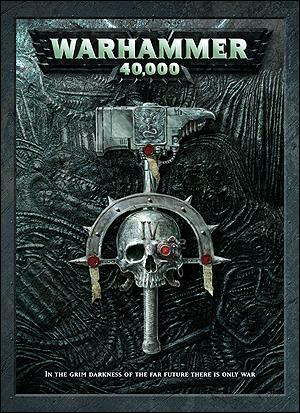 I am a very good 40k player, and have good lore. We March For Maggrage! And We Shall Know No Fear! I have an idea for the necron fraction ( if there is going to be one) all the fractions have starts so my idea was you start out as a team of explorers and you accidently' open a necron tomb most of the other explorers are killed but you and some other guys turn into necron warriors somehow then you create all the other stuff along your fraction. "They shall be pure of heart and strong of body, untainted by doubt and unsullied by self-aggrandisement. They will be bright stars in a firmament of battle, Angels of Death whose shining wings bring swift annihilation to the enemies of Man. So shall it be for a thousand times a thousand years, unto the very end of eternity and the extinction of mortal flesh." If you add the Tau ill join in. Sounds like great fun. Orkz is da strongezt! Waaaaaaaaaagh! If anyone is good with permissions and wants to pay $10 to support the server every month, you will get early access (if available) and become and Owner. PM me an application with MC name, real name, age, experience and why we should pick you. As a note, if you lie in the application, you will be switched out. Heres what happens when you join: Your in a small room, you pick WHICH race you want by going through to that portal, and of course, changing your skin and joining that group, once you go through your portal, youll be in your starter mission, spacemarines, for example: Your crashed in a dropship, and not many members of your squad have survived, you must get to the evac point, and go through the portal aboard the ship, once doing that, you will be teleported to another ship, already at the Spacemarine stronghold, when you are done doing that, type /kit spacemarine and you will recieve the spacemarine armor, weapons, and supplies needed to start out. after that, you can create your own chapter, and make your own base, for the imperium.......Chaos Starter: You are a small squad of Spacewolves pinned down in a small imperium outpost, chaos heretics all around you, your squad is destroyed, and finally killed...you however..they want alive, they can feel the herecy emitting from you, and will transform you into chaos spacemarines..............Ork and the other races i dont have time to post, ill post them later, hope to see you there, for the Imperium, for the BLOOD GOD, SKULLS FOR THE SKULL THRONE, and finally MILK FOR MY KHORNE FLAKES! Now, if anyone would like to help, make buildings, and are experts on Warhammer 40k, just ask me for the IP for the PRE structure server, we will build most buildings of the races there, and TRANSFER them to another with copy paste, just let me know. We will also make CUSTOM skins for ranks: Chaos Ranks, Spacemarine Ranks, Ork Ranks, Eldar Ranks, Inquisition ranks, Imperial Guard ranks, they will all be CUSTOM one of a kind skins!